The hallway or the area right after the entrance door is often the stage to a chaotic mess. That despite the fact many homes have a shoe cabinet or rack. Simply because it's not the shoes being the problem, but all these other things you end up leaving by the door. Such as: empty grocery bags, bills, dog leash, small outdoor toys, school bags, some even leave their purse there (which is not the best place to keep it safe). 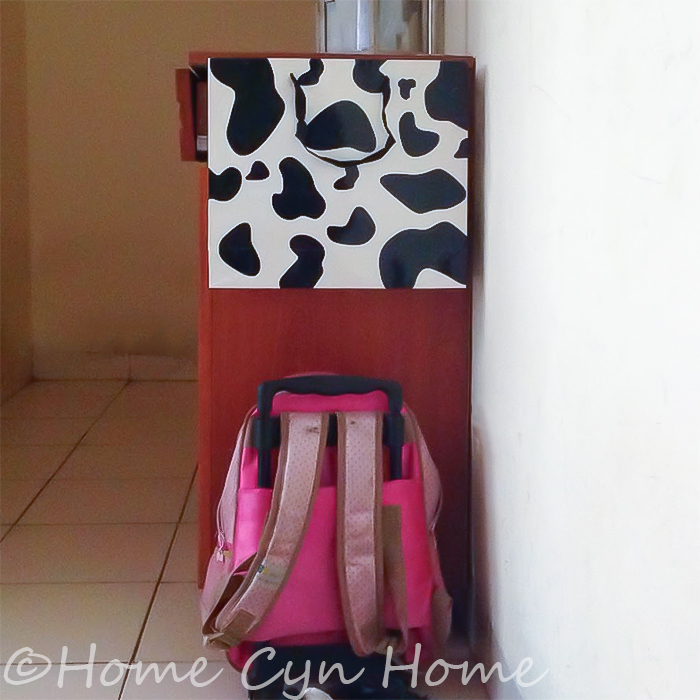 Our home was no different, and I would end up de-cluttering the area on a regular basis. Not to mention getting really annoyed at my maid. Maid who upon seeing that the place was anyway a mess took it to mean all mess was to be dumped there. And of course, this always lead to a couple of "Have you seen the dog leash somewhere?". This is an old paper gift bag we had lying around. I installed it after the first brown shopping bag broke a few weeks ago. This one is sturdier, and to make it hold into place better than the first, I used nails and pushpins instead of the double sided tape I used on the first bag. Our shoe rack is old, rickety and will probably get replaced in the future, so hammering some nails into it didn't feel like a big deal. 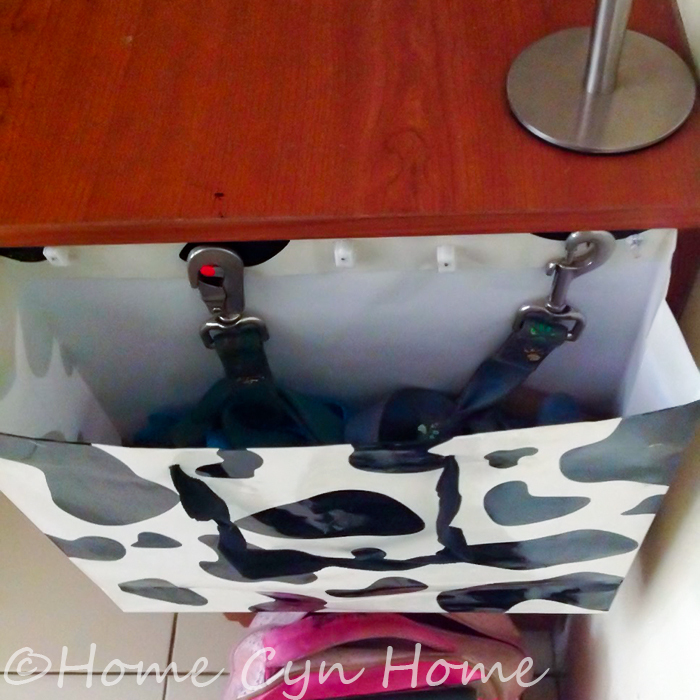 If it was newer, I would do it in a more elegant and permanent way drilling nice holes, and using screws to screw a plastic basket to it, or even hooks to hook a nice washable canvas tote. The idea with that system is to get all the knick knacks that usually ended up on top or on the side of the shoe rack (or in the rest of the home) contained into one place. And to make sure the dog leashes never end up at the bottom forcing us to rummage furiously in the bag (which was what caused the previous bag to break); notice how I ended using the pushpins as a hook for them. The clasps are on the hooks, the rest of the leashes dangle in the bag along with all the small plastic and fabric bags we keep handy in that spot. I would have added a bowl on the top of the shoe rack to store our keys and other odd ends, but I like to keep my keys in the kitchen, and DH empties his pockets in his desk drawer every night, so the only thing left to store on top of that shoe cabinet is unread mail when there is some.